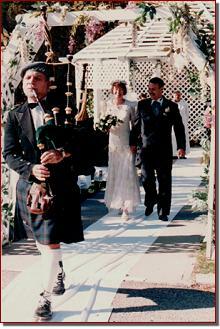 George Balderose, bagpiper, wedding and reception music. 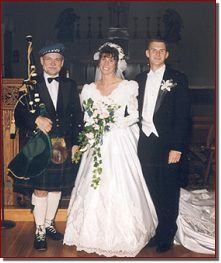 For centuries bagpipes have been played for weddings not only in Scotland and Ireland, but many European countries as well. Elegant and stately for church processionals, recessionals, or simply for the celebration of the occasion, the instrument heralds the marriage with music that speaks to heritage and tradition as few other instruments can. 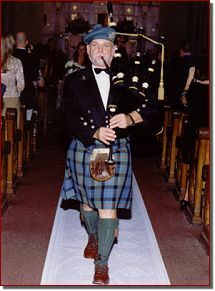 Upon request, I would be glad to send prospective clients a free copy of my CD, "Bagpipe Music for Weddings", with tunes organized by these wedding "moments". Playing outside the hall as the guests arrive. Piping the bridal party to their seats as they arrive at the hall. Playing during the receiving line. Playing for 10-15 minutes during an intermission in the band's or DJ's music. On my CD you can listen to the tunes and pick those you would like to hear during particular moments of your wedding ceremony or reception. Alternately, I would be glad to play any requests not on my CD. I also play several types of the quieter smallpipes, and can offer a wide range of versatility of tone and volume to accommodate smaller performance spaces. Click here for a list of Churches where I have played.